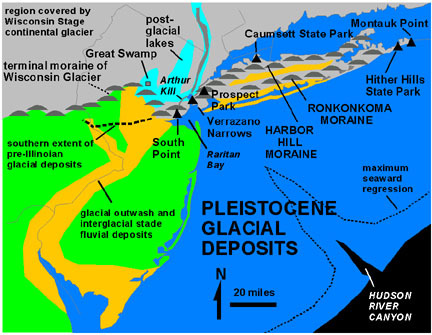 170 to 200 million years ago - Atlantic Coastal Plain begins to form. 100 million years ago - Atlantic Ocean repeatedly covers the coastal plain and then withdraws, depositing layers of geologic material. 12,000-15,000 years ago - End of the last ice age. Glacial ice gradually retreats, which had extended over northern New Jersey to reach as far south as Belvidere on the Delaware River and into current Morris, Middlesex, Union Counties and the Hudson waterfront. After the ice melts, it leaves such geologic features as Glacial Lake Passaic, the Hackensack Meadowlands and the Watchung Mountains. It fills valleys with sediment, depositing large quantities of a mix of sand, gravel, and rocks in the area along its leading edge. "Lenape Languages" by Wikimedia Commons licensed under CC BY-SA 3.0. About 10,000 BC - First humans appear in the region. 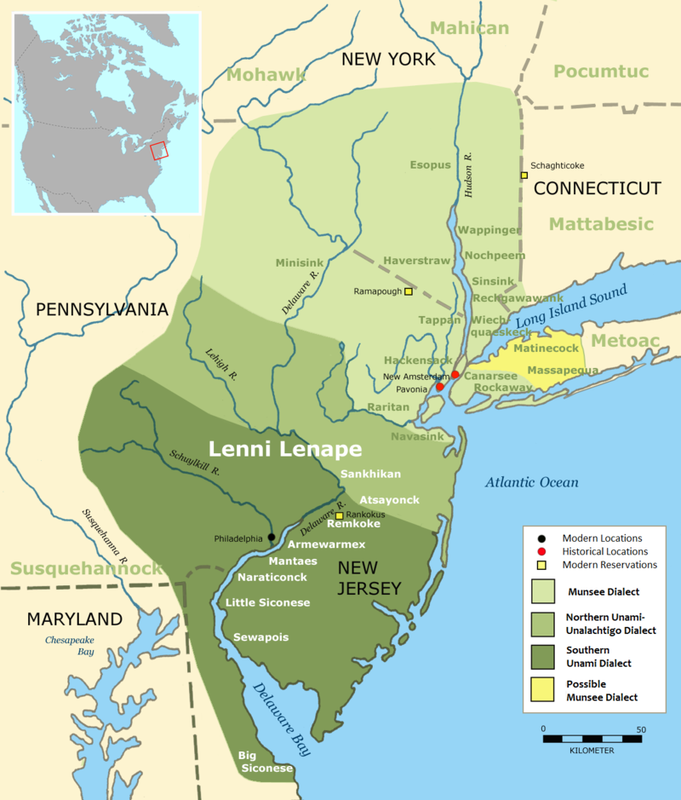 Native Americans who inhabit present area of New Jersey, Delaware, southern New York and eastern Pennsylvania call themselves "Lenni-Lenape," which literally means "Men of Men," but is translated to mean "Original People." Within the Lenape, tribal subdivisions are created by differences in language, such as those speaking Munsee, Unalachtigo or Unami dialects. 1524 - Giovanni da Verrazano, an Italian sailor sailing for the king of France to look for a water route to Asia, reaches what is now known as New York Bay and Sandy Hook in New Jersey. He is the first European to encounter Lenni Lenape Native Americans who live in the region. 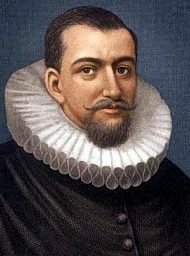 1609 - Henry Hudson, an Englishman sailing in the employ of the Dutch East India Company, enters Delaware Bay on August 28 and then sails up the coast to anchor off Sandy Hook on September 3. On a scouting party at Sandy Hook, one of his crew is killed by an arrow shot by Native Americans. 1621 - Dutch West India Company is chartered, establishes "patroon system" to encourage settlement and trade with Native Americans which required those receiving land to attract a sufficient number of settlers or be forced to sell their holdings back to the Company. 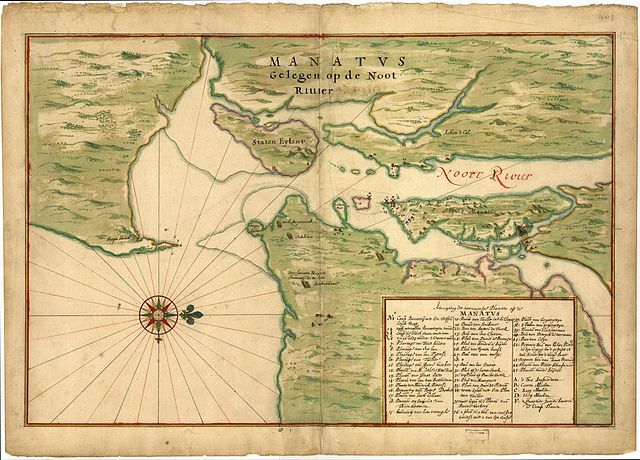 1623 - Captain Cornelius J. Mey sails along southern New Jersey coast into Delaware Bay, with its cape later named after him as Cape May, and up Delaware River and builds Fort Nassau on Delaware River near present Gloucester City and is named Director General of New Netherland. 1629 - Michael Pauw receives first Dutch land-grant from the Dutch West India Company on the west bank of the Hudson River in current Jersey City known as Pavonia as part of the "patroon system," which required those receiving land to attract a sufficient number of settlers or be forced to sell their holdings back to the Company. 1633 - Dutch begin settlement of Communipaw in current Jersey City. 1643 - Colonel Johan Printz named governor of New Sweden, Swedes build Fort Elfsborg on upper Delaware River in current Sussex County. - "Kieft's War" begins after Dutch Director General of New Netherland Willelm Kiefft, who had demanded payments of tribute from Native Americans, sends soldiers to attack Lenape, resulting in Pavonia Massacre during which 120 Native Americans, including women and children, are killed. Retaliatory attacks on Dutch by Native Americans continue for next two years. 1647 - Peter Stuyvesant is named Director General of New Netherland. 1655 - Dutch under Peter Stuyvesant send seven armed ships to invade New Sweden. Swedes surrender without resistance and Dutch take control of forts along Delaware River and Bay. - In retaliation for Dutch seizure of New Sweden and an incident in which a Dutch farmer shot a Native American woman for stealing a peach, Lenapes who had become Swedish trading partners send some six hundred warriors to invade New Amsterdam, which was largely undefended since Stuyvesant and Dutch soldiers remained to the south holding New Sweden. 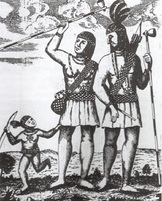 Native Americans then cross Noort (later Hudson) River and attack Pavonia, taking 150 hostages who were later ransomed after Stuyvesant returned with his soldiers. New Jersey settlements are temporarily abandoned as Dutch withdraw into Fort Amsterdam for greater security. 1660 - After Peter Stuyvesant negotiates an agreement to restore peace with Native Americans, settlers return to west shore of Noort River and establish Bergen Township on site of present-day Bergen Square in Jersey City. 1661 - First ferry licensed to transport passengers and goods between Communipaw and Manhattan Island. 1664 - King Charles II grants lands from the Hudson River to the Delaware River to his brother James, the Duke of York. The Duke of York names as proprietors of his lands John, Lord Berkeley and Sir George Carteret, who each had served as Royalist military leaders to restore the monarchy under Charles II. - England seizes New Netherland, which surrenders after James, the Duke of York, orders Colonel Richard Nicolls to lead 300 soldiers from four warships to invade Long Island and Brooklyn. Peter Stuyvesant signs articles of surrender under which Dutch settlers are promised fair treatment and protection of their property under British rule. In the following year, Nieuw Amsterdam is reincorporated under British law and renamed New York City. - Without knowledge of the grant to Berkeley and Carteret, Colonel Nicolls grants lands to settlers, creating a cloud on New Jersey land titles which would continue well into the next century. - Philip Carteret, a cousin of George Carteret, named first proprietary governor. - Lands known as Elizabethtown Tract, site of future settlement of Elizabethtown (Elizabeth), purchased from Lenapes by Englishmen Daniel Denton, John Baily, and Luke Watson. 1665 - Lord Berkeley and Sir George Carteret sign Concessions and Agreement establishing government for the colony of New Jersey and promising religious freedom and right to elect an assembly to encourage settlement. 1666 - Robert Treat, a former governor of the Connecticut colony, leads a group of other Puritans from Connecticut to found Newark, a name adapted from the Bible's reference to the "New Ark of the Covenant." The town continues to be governed under Puritan religious rules into the next century. 1668 - First Assembly meeting held in Elizabethtown, but townships of Middletown and Shrewsbury reject its resolution to order payment of quitrents to the proprietors and declare their independence, electing James Carteret as their leader. 1672 - James Carteret, son of Sir George Carteret, arrives in New Jersey and is elected governor by rebellious townships of Middletown and Shrewsbury. Philip Carteret departs for England, to consult Sir George Carteret and seek support from the English government. 1674 - Philip Carteret returns from England with "Declarations" of British government reaffirming rights of proprietors to collect quitrents; restricting rights of settlers to self-government; and denying recognition of land titles claimed through grants from Colonel Nicolls. 1673 - Dutch reconquer New York and New Jersey, but British regain control pursuant to a treaty between the two countries signed in February 1674. 1674 - Quakers Edward Byllinge and John Fenwick buy West Jersey from Lord Berkeley. 1676 - A group of Quakers led by William Penn, Edward Byllinge and John Fenwick execute a deed with Sir George Carteret known as the “Quintipartite Deed,” in which New Jersey was divided into two parts, the Province of East Jersey being taken by Carteret and the Province of West Jersey by the Quakers . The boundary line runs diagonally from the Atlantic coast at Little Egg Harbor northwest to the Delaware Water Gap. 1680 - New Jersey's first slaves bought for a plantation in Shrewsbury. - Sir George Carteret dies. Following his death, New York Governor Edmund Andros attempts to assert authority over East Jersey, seizes Governor Phillip Carteret and brings him to trial in New York, but Carteret is acquitted. 1687 - Edward Byllinge dies, and his heirs sell his interest in West New Jersey, including the right of government, to Dr. Daniel Coxe, a physician to the Queen of Charles II and afterward to Queen Anne. 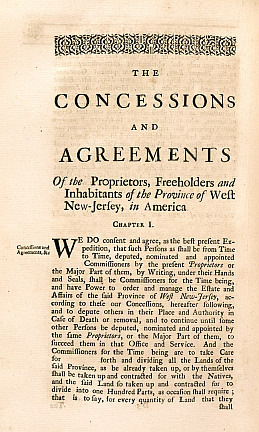 1692 - Dr. Daniel Coxe, West Jersey’s largest landowner who never visits the colony, sells governance and certain land rights for 577,000 acres to the West Jersey Society, a land speculation company with most of its shareholders in Britain. 1697 - Sixty-five residents of Elizabethtown petition the crown to abolish the proprietary government and unite East Jersey with New York.